This spring my five year old black lab Lucy had a limp in her rear leg. I got two Vet opinions and both were the dreaded torn ACL! I did a lot of research and found there were 3 or 4 types of operations to repair this. In my situation, with a large breed dog that was an active hunter, the best surgery would be the TTA. Unfortunately the TTA is also the most expensive operation but you get what you pay in this situation. I called Dr. Pete Lukasik for a consultation and decided to have the TTA procedure performed at Lakes Veterinary & Surgical Center. I would recommend this Vet to everyone. He is knowledgeable and experienced in his profession and has a love for animals. The best thing that came oozing out of Pete was he was not all about money. I did not feel that Lucy and I were on a conveyer belt moving along at a rapid pace so they could get at the next patient. Pete and his side kick (Vet Assistant) Shelley, spent more time explaining things and answering my questions of what they did in the operating room. 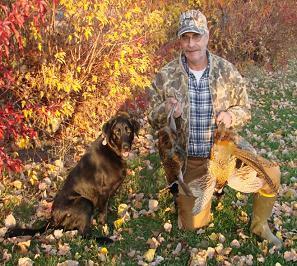 By the start of pheasant season in early October, Lucy was hunting in 2-3 hour shifts. That was only 3 months after her major operation! We finished the last day of the season hunting in 2 feet of snow north of Princeton MN. Lucy had to hop like a rabbit to get through the deep snow which was a true test of stamina. We hunted from 9am until 3:30 pm in that deep snow and got our three birds. The next day she had only a slight sign of stiffness that was gone after a few minutes of walking around. My stiffness lasted a little longer than hers, maybe because I am 58 years old. Lucy and I got 38 birds this year in Minnesota and none were from an easy game farm situation. I thank Dr. Pete, his assistant Shelley, and the rest of the crew for treating me and Lucy so well. I look forward to many more years of hunting and companionship with my buddy Lucy.